Everlearning hopes to create, inspire and locate existing tangible and virtual learning communities outside and independent of establishment academia but with a similar reverence for and claim to scholarship. One of the largest problems with traditional mainstream higher education is the fact that it is generally of limited duration and likely to produce graduates who then lapse into a state of perpetual educational stasis. Even those who publish on a regular basis are generally restricted in their subjects to a very confined and predetermined path within their specialties. The Uncollege Movement (to which EverLearning is closely akin) is more concerned with providing an alternative path to career success through bypassing traditional, often irrelevant and absurdly overpriced higher education than with perpetual education as a way of life which is our goal at everlearning. Please join us in whatever capacity suits you. The purpose of everlearning is to keep the educational process vital and perpetually flourishing — for its own sake and not in the service of a degree. Interdisciplinary cross-pollination is encouraged and supported and there is no better way to learn than to teach and no teacher should ever stop learning. Enthusiastic EverLearners are always willing to learn and to help others learn, regarding the educational process as an end in itself. Accessibility and creation of out-of-the-loop resources and educational communities are some of the goals of EverLearning. The one-size-fits-all mass production educational paradigm would clearly not be best for all learners, even if it were economical and relevant. As Albert Einstein put it: “Everybody is a genius. But if you judge a fish by its ability to climb a tree, it will live its whole life believing that it is stupid.” Some people learn better on their own, some in collaboration with others and a few are even most comfortable in a classroom environment. 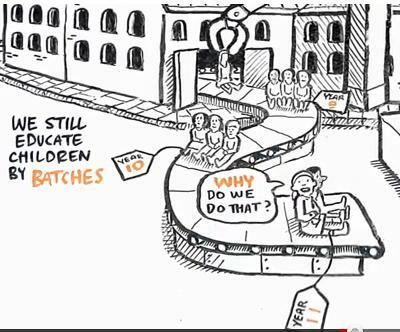 We recommend watching Ken Robinson’s Changing Education Paradigms. Universities are traditionally the place where learners, thinkers and knowledge constructors congregate, but the real learning often takes place not in the classroom but in the dorm, on the grass, on rooftops, in pubs, cafes and steam tunnels, in whatever environment presents itself. (See Fry’s discussion of dormschooling). I taught college for years, subjects that I had learnt the dorm, not in the classroom, and I feel that I was far better qualified to teach them than the subjects in which I had received official degrees. Unfortunately, it is often only at or around universities that such enthusiastic and improvisatory learning environments tend to spawn. But there is no reason that they should not flourish elsewhere as well. Everlearning hopes to create, inspire and locate existing tangible and virtual learning communities outside and independent of establishment academia but with a similar reverence for and claim to scholarship. Whether you are anxious to undertake open education for the first time or are a refugee or exile from mainstream academia, you are welcome. Please join us in whatever capacity suits you.